Please read this entire page before requesting help, all of your questions should be answered on this page. Especially helpful is the "Answers to Questions" section below. After reading all of the information on this page, feel free to contact us. The outage schedule is emailed to you within a week of receipt of the order. This will allow you fast access to the data. If you don't see the email in your in-box, don't forget to check spam and junk mail folders. Please look in there for an email from "Michael Rennhack", and tell your system to accept emails from us in the future. The nuclear plant Outage Schedule is emailed in MS Excel (.xls) format to business's and Adobe PDF format to non-business clients. The Business/multi-user license agreement limits the sharing of information to within your company. The non-business license limits the use to a single person, no sharing of information is allowed. The Excel format is not locked, so you may edit the file to suit your needs. When you order the Subscription, we will send you the current Outage Schedule within a week. When the next Schedule is available, we will send it to you automatically, and not wait on the next payment. (And continue to do so until you cancel your subscription.) As such, the day your next auto-payment is made, don't expect another outage schedule, because we will have already sent you the most recent schedule. If it's December - May, you will receive the Spring outage schedule, even if all of the outages are over. Because that is the CURRENT outage schedule. If it's June - November, you will receive the Fall outage schedule, even if all of the outages are over. Because that is the CURRENT outage schedule. If you do not order a subscription, you will be sent the current outage schedule, and any updates we make to the current outage schedule for three months. The nuclear plant outage schedule is provided for informational purposes only, and is not intended for scheduling purposes. It is believed correct at the date of creation, however, outage schedules are subject to change at a moments notice. Neither NukeWorker.com, it's officers, nor any of its data or content providers shall be liable for any errors or delays in the content, or for any actions taken in reliance thereon. The information is provided for your convenience only, should you need exact, up to the second information, please contact the Management of the Nuclear facility in question. NukeWorker.com shall not be liable for any damages or costs of any type arising out of or in any way connected with your use of the Outage Schedule. 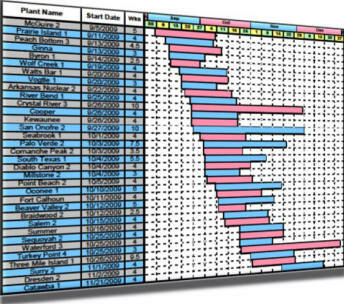 The Nuclear Plants Outage Schedule is a Gantt chart, which is a graphical representation of the duration of tasks against the progression of time. It includes a bar graph showing the schedule dates versus a time line. It also includes the specific estimated start date and duration in weeks. Our Outage schedule information is verified by four independent sources to authenticate accuracy. If an outage date or duration changes, a new schedule is sent to your free of charge. If you are a gold member, click here. To find the location of each facility, please use our Facility Info section. Click here to find the location of Nuclear Plants. Click here for Local Union Numbers for Nuclear Plant outages. If you are looking for a job at an outage, please try our job board. The outage schedule does not come with a list of who has the contracts at each facility, or how to contact them, that is what the job board is used for. This web page was last updated on Friday, August 29, 2008 By Michael D. Rennhack.